The Boathouse is an efficiency cottage that accommodates 2. 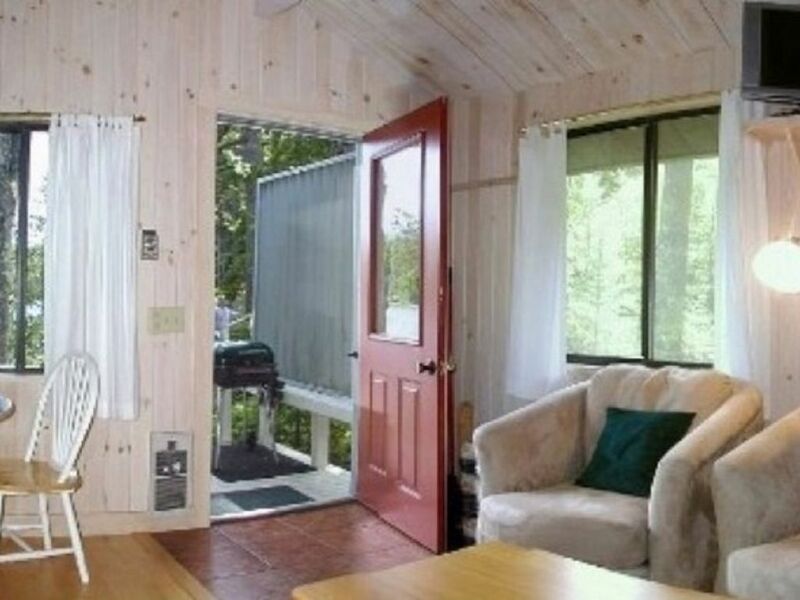 It has everything you could ask for in a romantic cottage getaway. The Boathouse is a waterfront cottage located on the shore of Hodgdon Pond, a fresh water pond on the west side of Mount Desert Island. Hodgdon Pond is very quiet and peaceful and is bordered by Acadia National Park that protects the watershed from future development on the east side of the pond. From the front deck, you look right out over the beach area and dock where there are kayaks, canoe and rowboat for the free use of our guests. Amenities include: The efficiency of one room living area with a queen size bed, kitchen with dinette, range and refrigerator and two chairs to relax in. The separate bathroom has a shower. There is a land line telephone where cell service can be limited due to the location. Satellite cable TV, and internet is also provided. The spacious deck has an outdoor grill. It also has heat for any chilly nights. The recreational, cultural, and dining offerings in this area are phenomenal. Acadia National Park is at your fingertips. The Park has nearly 32,000 acres of land which offers unequaled beauty and ocean front access. Over 55 miles of carriage trails provide hiking and biking with vistas of unrivaled beauty. Very private, well maintrained immaculate cottage. Cozy with everything we needed in a well-organized small space. We Loved Acadia Park and Bar Harbor. Enjoyed the Many beautiful yet not-too-difficult walks and hikes. We stayed for a week and enjoyed the quiet and pond access. The cottage was clean and bright and comfortable for the 2 of us! Would recommend this property! Location made it easy to get to other side of Island as well. We have stayed in many cottages in Maine over the years and the Boathouse ranks up with the best. It was just what we were looking for... and more. Simple and serene. Quality furnishings and bedding. The setting is majestic -- a beautiful view of the wilderness of Acadia National Park, which surrounds much of Hodgdon Pond, The cottage is well maintained and aesthetically pleasing. The location is on the quiet side of the island. Much of the sightseeing is a bit of a drive. With that said, we found we loved being at the Boathouse - kayaking, canoeing, picnicking, swimming, bird watching , reading, napping (the mattress was very comfortable), and exploring the nearby inlets. The kitchen items were minimal. We wished the indoor seating was more comfortable for reading and putting your feet up -- but we spent most of our time in the beautiful outdoors. We loved our stay at the Boathouse! We really enjoyed our stay at the Boathouse. The view from the house across the pond is lovely and we used the kayaks to explore the pond. The inside of the house is very nice too. The kitchen is small and sparse, but we ate out for most meals, so it worked well for us. We absolutely loved our stay at the Boathouse. The cabin was spotless, clean, and very cozy. The lake front and dock were ideal. The lake is very private and pristine. We saw two bald eagles while sitting on the dock. We enjoyed the kayaks as well. The week passed too quickly. This is a perfect place to stay! Thank you! Biking, beaching, hiking, canoeing, kayaking,fishing right at your doorstep as well many other areas on Mount Desert Island. Whale watching from Bar Harbor just 20 minutes away. The stars at Cadillac is a must see. Fine dining is in all of our villages, SW Harbor, Bar Harbor, Northeast Harbor and Tremont all within a half hour of Hodgdon Pond. Shopping T Shirt Shops to designer brands are available. The Gilley Museum of bird carving is located in SW Harbor. Seal Cove Auto Museum just a few miles away. The Abbe is in Bar Harbor and there are several others to explore. Art fairs and musical groups are always available for your enjoyment.